Coughs are sometimes very chronic and can cause harm, if not dealt properly. 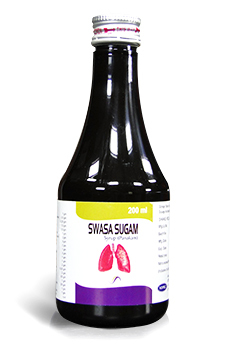 Swasasugam is formulated with the combination of herbs, which are effective in relieving irritation of the mucous membranes in the mouth. It also provides relief from sore throat. Take 5 ml twice a day after meals or as directed by your physician. What are the health risks associated with the inflammation of the respiratory tract? Prolonged, untreated respiratory tract conditions can permanently impair the tissues of the lungs leaving it open to more severe lung disease such as pneumonia. Is there any toxicity concern shown in the study of Swasasugam Syrup? Some herbal chemicals can induce mutations and can also be responsible for future mutations. Mutations are responsible for abnormal cell growth that could lead to toxicity and cancer. 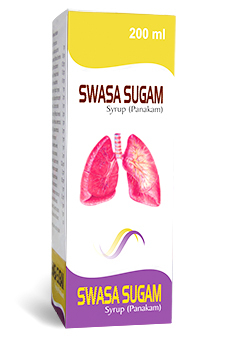 To test that there is no such effect, Swasasugam Syrup has been subjected to comprehensive research study. Using analysis known as 'bacterial reverse mutation' method, Swasasugam Syrup has been tested for mutagenicity, toxicity and carcinogenicity. The study showed that there was no significant finding for such toxicity.